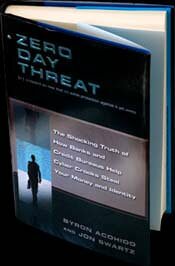 Zero Day Threat: The Shocking Truth of How Banks and Credit Bureaus Help Cyber Crooks Steal Your Money and Identity has just been awarded the prestigious Excellence in Financial Journalism Award for general audience books from the New York State Society of Certified Public Accounts. Z DT is a digital true-crime thriller that chronicles the tumultuous transition from hacking for bragging rights toÃ‚Â the current world of cybercrime for pure profit. ZDT reveals the role the financial services industry has played, aided and abetted by tech giants, in rapidly commercializing the Internet, without considering the consequences of opening Pandora’s box. As many of you know, the Internet began asÃ‚Â a military/acamedia experiment in anonymous network-to-network communications. It was never intended, nor designed to serve as a secure transactions network for global commerce. You can see the reviews and praiseÃ‚Â ZDT received from technologists, journalists and regulators here. And you can see some of the press coverage, including radio and TV interviews of the co-authors, here. And you can buy the book here. Thanks goes out to all our security, tech, law enforcement, financial services industry, legal and other contacts and expert sources who so graciously helped us with guidance and expertise. We couldn’t have done it without you. ZDT chronicled developments in the tech security landscape from 1999 through late 2007. Stay tuned here on LastWatchdog for the sequel, which is in the works, and will chronicleÃ‚Â the rich period from late 2007 to present.